Is Your Kitchen Sabotaging Your Diet? Welcome to Part Two of a three-part series on how your home can help (or hinder) your personal goals. It seems like all of us have tried to lose weight at one time or another, but let’s focus on how to make it easier to make healthier food choices whether or not you want to lose weight. Let’s start with a few easy fixes. (And if you don’t find them easy, leave it to me to find just the right solution!) First, clear off the counters. Clutter creates chaos in your mind, and then anxiety, and for many people that’s a trigger to eat. With so much going on to grab your attention (mail to sort, a clear cookie jar, pots and pans to put away) you can’t focus on what you really need to do, which is to make a smart choice about what you’re going to eat next. Instead, select just a few objects for the counters, like a colorful vase full of flowers and a beautiful bowl filled with fresh fruit. Ask me about the latest in cabinet shelving design and organization and we can really get things off the counters for good. 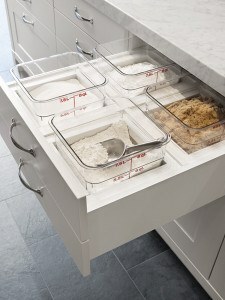 This pull out baking drawer is a current favorite. How is your pantry organized? Place the most healthful foods and ingredients at eye level. 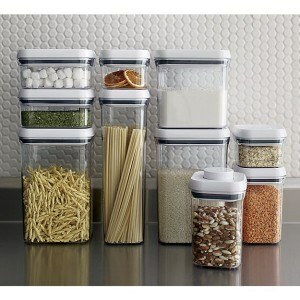 Stash the treats out of sight or place them inside opaque containers. You may have heard of using smaller plates, and that really can change how you perceive how much you are eating. I say make it fun though by also selecting a new tablecloth, napkins and coordinating rugs. Blue is a good choice for all of these, and here’s why. Color psychologists say that because blue is a calming color that it can help you to slow down your eating and slow down the choices you make. You’ll eat less, and eat smarter. Blues can also work wonderfully as a paint color in a kitchen. Consider blue as an accent for curtains and upholstery. For inspiration, hop on over to Pinterest to check out my board “Blue for Kitchens,” and then give me a call for a paint consult to find a shade that works with your kitchen’s natural lighting and current color palette. For more ideas specific to your home, give me a call or leave a comment below.